Additionally, hunters and fishers submit to additional taxes every year when they purchase their hunting and fishing licenses. This may seem trivial, but an avid hunter and fisher in the State of Wisconsin will buy: a small game license, an archery deer license, a gun deer license, a state waterfowl stamp, a federal waterfowl stamp, a turkey permit, a fishing license, a great lakes trout stamp, an inland trout stamp and a state parks access pass, along with other stamps and permits. A conservation patron license in Wisconsin in 2018 encompassing these licenses will cost a resident $160 and a nonresident $600, and both resident and nonresident will also need to purchase a federal waterfowl stamp for $25. This totals up to $185 for a Wisconsin resident and $625 for a nonresident in 2018 alone. Meanwhile a non-hunter and non-fisher who likes to camp will purchase just a state parks access pass totaling $28 for a resident and $38 for a nonresident in the same 2018 period. This may not seem like a big deal but in 2017 Wisconsin had approximately 799,000 gun deer hunters alone; many hunters also fish, which leads to a substantial amount of money brought in to support conservation and the environment just through Wisconsin’s hunting and fishing license sales alone. The excise tax money and the money generated from license sales go directly towards conservation, wildlife restoration, and environmental enhancement that benefits not just hunters and fishers but the population in general. The modern conservationist understands that it is necessary to selectively kill an animal for the benefit of the population and the environment it lives in. This is necessary for both population density issues as well as to ensure that the breeding populations in the area are kept at optimum levels. What this means is that although a hunter may purchase a license and spend 100 days in the field attempting to kill an animal, at the end of the season they may not have chosen to take any animal that they have observed. On the other hand, it is sometimes necessary to take several animals out of an environment to ensure that disease and starvation due to over population does not occur. As humans have eliminated the animals’ natural predators or have introduced nonnative species, the job of population control has fallen on hunters to ensure that the environment’s carrying capacity is monitored and kept in check. The modern world is responsible for the decimation of entire species and populations of animals, but it is ultimately the hunters, fishers and conservationists who are responsible for the reintroduction of species and their protection. Wild turkeys may be the best example of reintroduction and management of a previously eliminated species. 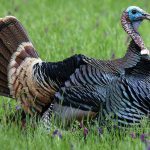 Due to the work of the DNR along with conservation groups, turkeys not only were reintroduced but are now thriving in Wisconsin and as such are being managed for long term sustainability in this state. I still remember growing up when seeing a turkey was considered a rare sight and something special; now almost every area in the state that can support turkeys has a healthy population and daily sightings are not uncommon. Elk have not only been reintroduced in Wisconsin but now have a large enough population to support a small number of tags being issued for 5 bulls this fall. This is especially impressive given the decimation that the elk herds took following a couple of harsh winters and a boom in the wolf populations that helped to severely reduce the size of the herds. Lake trout, while still a fragile species in Lake Michigan due to a changing ecosystem from the invasive zebra and quagga mussels and the resulting increased clarity of the lake, are making a comeback due to increased protection. Additionally, conservationists have increased protection of lake trout through reducing bag limits, eliminating commercial fishing for lake trout, and a large-scale effort to eradicate the sea lamprey, which significantly affected lake trout populations. Brook trout are being reestablished into streams that can support a natural reproduction through stocking, habitat restoration, and increased regulations being put in place to protect these waters. Additionally, annual stocking of brown trout and rainbow trout in waters adjacent to these reestablishment sites helps to decrease the fishing pressure and allow the area to reestablish itself. While hunters, fishers, and other conservationists act as stewards of the land not only for their own benefit but for the benefit of all future generations, they do so because they have made an active choice to bear the majority of the cost and responsibility of protecting our natural resources. So, when some talking head who barely contributes if at all to the protection and management of the land attacks and belittles a hunter, they are in effect attacking the major if not sole source of funding for protecting an animal or area that they claim to care so much about. I am confident to say that as a hunter, fisher, conservationist and steward of the land I spend more money every year that is not tax deductible on protecting animals and the environment than any so-called environmentalist who offers no proof whether scientific or otherwise to back up their statements that hunting should be banned or that hunters do not care about animals.